The 2007-2008 USDA National Animal Health Monitoring System Beef Study documented that Bovine Respiratory Disease (BRD) is a serious health challenge for U.S. beef cow-calf producers: respiratory disease is the most common cause of death in calves over three weeks old. The WSU Beef Team, already engaged in a five year USDA-funded project called “An Integrated Approach to Control of Bovine Respiratory Diseases”, obtained additional funding from the Western Center for Risk Management Education to fund an outreach series to present newly-developed, evidence based educational materials to cow-calf producers throughout the state. Team members conducted workshops in five locations, directly reaching 104 producers. At each workshop, producers were asked to complete a self-assessment of their ranch’s BRD risk, received notebooks with 11 educational modules, interacted with Extension professionals delivering educational content and were encouraged to request an on-farm BRD risk assessment conducted by team members. Educational module topics focusing on reducing BRD risk included managing pregnant cows; calving management; optimizing calf care; weaning procedures; cattle handling; vaccinations; preconditioning; transportation; biosecurity; and documenting BRD incidence and health costs. An audience response system was used to measure knowledge gains immediately after each workshop. Results indicate substantial increases in all evaluated areas. The fact sheets generated through this program will enter the WSU Fast Track system to increase their access and impact. BRD team members have visited and will continue to visit cow-calf ranches to conduct requested BRD risk assessments and help producers develop management plans to lower the BRD risk of their herds. J Anim Sci. 2014 Feb; 92(2): 498-510. Van Engen N.K., et al. Transportation stress can result in significant economic losses to producers due to decreased animal productivity and increased medication costs associated with sickness such as bovine respiratory disease (BRD). Meloxicam (MEL) provides pain relief and anti-inflammatory effects in cattle for several days after a single oral treatment. Our hypothesis was that MEL administration before shipping would reduce the impact of long-distance transportation on circulating physiological biomarkers of stress and inflammation in beef steers. Ninety-seven beef steers were blood sampled for baseline biomarker determination and then randomly assigned to receive either 1 mg/kg MEL (n = 49) or a placebo (CONT; n = 48) per os before a 1,316-km transportation event lasting approximately 16 h. Calves were then blood sampled on arrival and 5 d later. Changes in the hemogram, circulating plasma proteins, total carbon dioxide (TCO2), fibrinogen, substance P (SP), cortisol, haptoglobin (Hp)-matrix metalloproteinase-9 (MMP-9) complexes, and tumor necrosis factor α (TNFα) between treatments over time were compared using a mixed effects model with statistical significance designated as P < 0.05. Analysis of covariance was conducted to assess the relationship between circulating MEL concentrations and biomarker changes over time. An increase in neutrophil, platelet, monocyte, white blood cell, and red blood cell counts occurred after transportation (P < 0.0001) and a decrease in lymphocyte count were observed (P < 0.0001). Meloxicam treatment reduced the stress-induced neutrophilia (P = 0.0072) and circulating monocyte count (P = 0.013) on arrival. Mean corpuscle hemoglobin (P = 0.05), mean corpuscle volume (P = 0.05), and lymphocyte count (P = 0.05) were also greater in the CONT calves compared with MEL calves after transportation. Furthermore, Hp-MMP-9 complexes, TCO2, TNFα, plasma proteins, and SP increased and cortisol decreased after shipping (P < 0.01). Meloxicam treatment tended to reduce serum cortisol concentrations (P = 0.08) and there was evidence of a time × treatment interaction (P = 0.04). An inverse relationship between plasma MEL concentrations and circulation cortisol concentrations (P = 0.002) and neutrophil (P = 0.04) and basophil counts (P = 0.03) was also observed. The results suggest that MEL administration may reduce the impact of long-distance transportation on circulating physiological biomarkers of stress and inflammation in beef calves. J Am Vet Med Assoc. 2013 Aug 15; 243(4): 538-47. Objective-To identify herd-level risk factors for bovine respiratory disease (BRD) in nursing beef calves. Design-Population-based cross-sectional survey. Sample-2,600 US cow-calf producers in 3 Eastern and 3 Plains states. Procedures-The associations of herd characteristics with BRD detection in calves and cumulative BRD treatment incidence were determined. Results-459(177%) surveys were returned and met the inclusion criteria; 48% and 52% of these surveys were completed by producers in Plains and Eastern states, respectively. mean (95% confidence interval) number of animals in herds in Plains and Eastern states were 102 (77 to 126) and 48 (40-56), respectively. Bovine respiratory disease had been detected in ≥ 1 calf in 21% of operations; ≥ 1 calf was treated for BRD and ≥ 1 calf died because of BRD in 89.2% and 46.4% of operations in which calf BRD was detected, respectively. Detection of BRD in calves was significantly associated with large herd size, detection of BRD in cows, and diarrhea in calves. Calving season length was associated with BRD in calves in Plains states but not Eastern states. 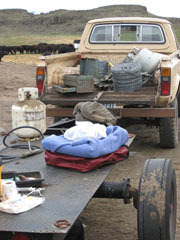 Cumulative incidence of BRD treatment was negatively associated with large herd size and examination of cows to detect pregnancy and positively associated with calving during the winter, introduction of calves from and outside source, offering supplemental feed to calves, and use of an estrous cycle synchronization program for cows. Conclusions and Clinical Relevance-Results of this study indicated factors associated with calf BRD risk; modification of these factors could potentially decrease the incidence of BRD in nursing calves.